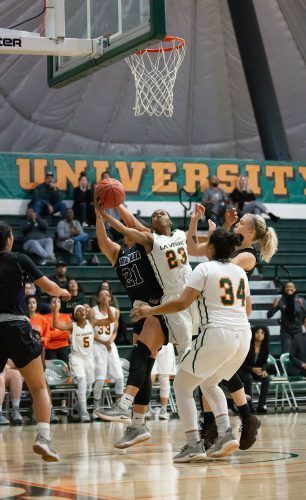 The women’s basketball team could not protect the ball nor capitalize on three point shooting, losing to Whittier 66-41 in the Leopards’ first Southern California Intercollegiate Athletic Conference game of the season. The Leopards committed 23 turnovers and went 1-for-25 behind the three-point line. After finishing 5-20 overall, with a 3-13 record in SCIAC play last year, head coach Jason Pruitt primarily focused on recruiting transfers to La Verne. The Leopards were without their leading scorer, senior guard Clarissa Perez, who is expected return during winter break. Perez was second in the nation in scoring last season at 24 points per game. Both teams got off to a slow start on offense, as La Verne took a different approach and did not follow their aggressive, run and gun system. Whittier quickly hopped on the board with senior forward/center Monica Hanna scoring five points in under a minute and their defense to slow down the Leopards’ offense. Junior guard Cali Cubel hopped on the scoreboard immediately by aggressively looking for the right cuts from her teammates, which led to 7-0 run in the first quarter and the game. With 5:20 left, freshman guard Jazzlyn Johnson made a 17-foot jump shot to get the Leopards on the board. Junior forward and center Hannah Rogers followed with an easy lay up after a nice entry pass from junior guard Monica Garcia Silva. Senior guard Angie Steel made a free throw to end the quarter, with Whittier winning 16-5. The second quarter was full of energy and emotion as players on both sides played more physical, with a spoonful of shoving and pushing as they hustled for the rebound and loose ball. The Leopards switched to a zone defense to slow down Whittier’s tempo, which lead them to score nine unanswered points and cut the lead down to six. Steel was dragged to the ground throughout the game a few times but focused on keeping her composure as it progressed. “I just outlook on the next play since we have another play, possession and substitution,” Steel said. Despite the first quarter adjustments made, the Poets bounced back on the offensive side, rotating and filling in each spot on the floor, led by Cubel’s six points. Whittier stretched the lead to 30-15 at halftime. 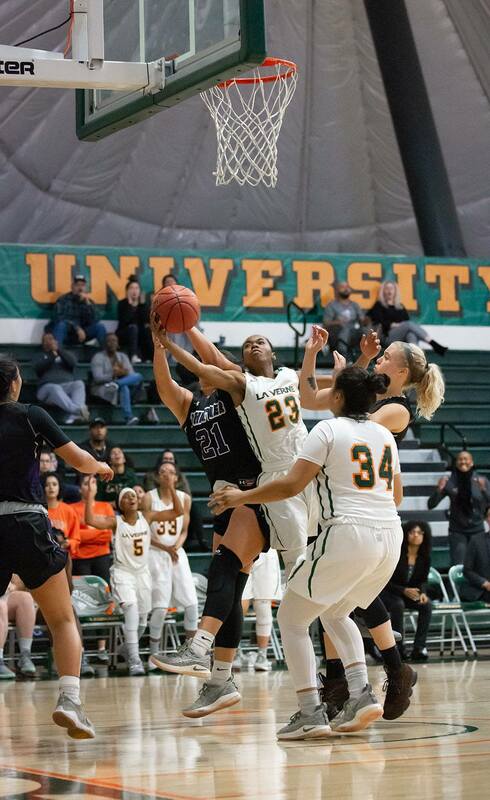 Throughout the second half, La Verne was unable to hit most of their shots and were out-rebounded by Whittier’s post players due to the height difference and fatigue from the Leopards’ side. This caused the Leopards to make more adjustments as the game progressed. La Verne played in a completely different tempo compared to their regular game style, which put a negative strain on the players and ability to score. “We had to speed the game up; we were trying to play a half court set and that is not our game,” Johnson said. The Leopards had costly turnovers from mental mistakes and were unsuccessful at stopping Whittier’s aggressive fast break attacks to the basket. Whittier quickly increased their lead, led by Cubel, sophomore guard Teani White and senior guard Zaria Branch. Whittier led 45-31 to begin the fourth quarter. La Verne’s second and third units successfully slowed down Whittier’s attacks, but could not convert on the offensive side, despite adjusting to their usual run and gun style of play. As a result, Whittier was able to capitalize on the Leopards’ mental errors and turnovers, tiring them out and stealing the victory from them. The Poets defeated La Verne 66-41, led by Cubel’s 21 points and White’s 15 points. “It was probably one of the worst performances we had since I’ve been here,” Pruitt said. The Leopards’ bright spot was Johnson’s SCIAC debut performance. The freshman had 14 points, six rebounds and one assist and was the only Leopard who scored in double digits. Despite the loss, senior guard Bailey Kurahashi remains hopeful sees the team’s potential for the rest of the season. “I think we have huge potential,” Kurahashi said. La Verne falls to 2-3 overall and 0-1 in conference, while Whittier improves to 4-0, with a 1-0 SCIAC record. The Leopards look to bounce back on the road against Redlands at 2 p.m. Saturday. Nicolette Rojo can be reached at nicolette.rojo@laverne.edu.